Since the very beginning of the archive set-up (2001) its activities have been focused on collecting any tracks of activity related to the history of the Polish fraternities and its members. 1. Insignia (fraternity caps, sashes, badges, seals, rapiers, coats-of-arms, flag and the like). 2. Documents (correspondence, diplomas, fraternity cards, chronicles, memoirs, photos and the like). 3. Publications (commemorative books, statues, newspapers, one-off issues, postcards and the like). 4. Any other items related to fraternity or their members activities (dedicated books, cigaterre cases, watch chains, fraternity signet rings and the like). 5. Written, recorder or in any other way registered (i.e. film, audi cassette, CR-rom or other electronic carriers) reminiscences and reports on fraternity history and traditions, whereby any songs are particularly welcome. Let us draw your attention to some particularities the a/m items have in common. Firstly - the sign of the so-called fraternity compass i.e the monogram composed of the letters V, C, F interwoven with one another (i.e the first letters of the motto Vivat, Crescat, Floreat) followed by the first letter of a given fraternity (for example in case of Lechia fraternity the compass is composed also of L letter). The compass is ended with an exclamation mark. The badge - the so-called compass of Lechia fraternity (Poznań). The watch chains - Hermesia (Poznań). The coat-of-arms of Obotritia fraternity (Lviv). The sash of Magna-Polonia fraternity (Poznań). A metal buckle on its end shows an engraved fraternity compass. We will be grateful for any information related to fraternity mementoes as well as for biographic infos on late fraternity membres and for contacts to reach their families. Every single information facilitates our search. You are also kindly asked to keep the familites of the late fraternity members also informed about the idea of this archive. Any help will be greatly appreciated (vide Contact). The second task of this archive is to exhibit collected mementoes and information on history and tradition of the Polish academic fraternities. With this task in mind, the on-line Museum of Polish Academic Fraternities was founded in the year 2007. The idea behind the museum is to present the history of Polish fraternity movement, making use of the collected items (vide Fraternities Museum). Almost 200 pages of papers on the history of Polish academic fraternities let alone several hundred accompanying photos are shown here. The collection is systematically developed. Any help will be greatly appreciated (vide Contact). 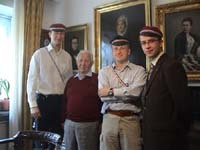 Another important objective set for the Archive is to promote Polish fraternity movement. Given the above, the archive provides help to restore pre-war academic fraternities. 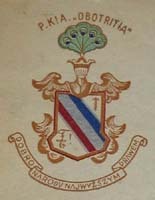 Since 2001, archive collection made it possible to reconstruct the fraternity insignia (caps, sashes, badges) of several fraternities restored in the recent years, namely: Chrobria (Poznań, 2002), Baltia (Poznań, 2002), Magna-Polonia (Poznań, 2004), Masovia (Poznań, 2006), Wisła (Gdańsk, 2006), Hermesia (Poznań, 2007), Surma (Poznań, 2008). Moreover, newly restored fraternities were extensively making use of other items collected within the archive (publications, documents, photos). Over the last weeks, the archive materials have helped restore subsequent Polish fraternities, Cresovia Leopoliensis (Wrocław) and Roma (Poznań) in particular. Since 2001 the archive is made available to all the university fraternities which actively run their activities nowadays. With the use of the collected items, it was possible to provide necessary information to majority of Polish fraternities from Gdańsk, Warszawa, Poznań, Toruń, Lublin and Wrocław. - D. Pater, P. Tomaszewski, Od morza jesteśmy. Świadomość pomorska w myśli i działalności akademickiego ruchu korporacyjnego w Polsce w czasach II Rzeczypospolitej, Toruń 2006. Furthermore, archive materials are available on some internet sites of particular fraternities eg. www.magnapolonia.pl, www.masovia.org, www.surma.org.pl). Over the last years, the archive content has been presented to the public during meeting and open lectures. In 2006-2007 the Fraternities Archive developed the “Last senior members” campaign. Its aim was to take and record interviews with pre-war fraternity members being still among us. To our best knowledge, in summer 2006 there were still 100 pre-war fraternity members living. Between ten and twenty were living abroad. The youngest men in this group were 86, whereas the oldest nearly 100. With this campaign, lasting from September 2006 till September 2007, we managed to take interviews with 59 pre-war fraternity members from 38 fraternities altogether. We still seek living pre-war fraternity members. Any information will be greatly appreciated (vide Contact). 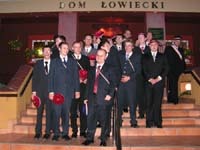 2007 saw opening of the first in series of exhibitions aimed at presenting history and traditions of the Polish academic fraternities. In January 2007 the Poznań inter-fraternity group prepared an exhibition entitled “Student organisations in Poznań in the past”. The exhibition was housed in the Poznań University of Economics. Its aim was not only to commemorate the pre-war fraternities active those days in Poznań, but also to promote modern fraternity movement as a whole. The visitors could see copies of pre-war fraternity insignia and some 180 photos illustrating the history of fraternity movement in Poznań. All the exhibited items belong to the Fraternities Archive. It is planned to install this exhibition also in other universities of Poznań. Next, we would like to organise similar exhibitions in other university cities of Poland. •	those fraternity members who were murdered by Bolsheviks in 1940. The plaques are to be unveiled to commemorate the 90th anniversary of the Wiekopolska uprising outbreak, the 90th anniversary of the set-up of the University of Poznań and the 70th anniversary of the Katyń massacre. With this initiative underway, any information on Polish fraternity members taking part in the Wielkopolska Uprising as well as on those murdered in Katyń and other places will be greatly appreciated (vide Contact).